If you were impressed by the extravaganza of Prince Harry's and Meghan Markle's wedding on Saturday, then EHF Marketing has something in store for you: a ticket upgrade that makes you feel like king or queen of handball at the VELUX EHF FINAL4 2018 on 26 and 27 May in Cologne's LANXESS arena. With the final weekend of Europe's premier club competition only a few days away, EHF Marketing offers all ticket holders the unique opportunity to experience the tournament in truly glamorous fashion. Fans, who have already bought a ticket, can now upgrade it to receive a seat in the newly established VIP Fan Box. 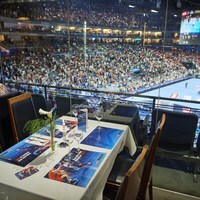 This box offers the best seats with the best view in LANXESS arena when Europe's four best handball teams take to the court. Furthermore, many greats of the sport, such as former World Handball Players, Filip Jicha and Jackson Richardson, former French international and 2008 Olympic champion, Joel Abati, and Anja Althaus, who won the Women's EHF Champions League with Hungarian side Győri Audi ETO KC only a week ago, have confirmed their presence at the VELUX EHF FINAL4 2018. The upgrade to the VIP Fan Box will not only allow you to mingle with these stars and many more in the VIP area, but it gives you the opportunity to meet them face-to-face as they will join the fans in their VIP box. Upgrades are offered for all ticket categories, but places are limited. If you always wanted to feel like a royal for two days, email ehfFINAL4@ehfmarketing.com to receive your personal upgrade offer at a special fan rate for this once-in-a-lifetime experience. Be fast though as the opportunity to upgrade your ticket only valid for a couple of days and expires on Wednesday, 23 May, at midnight.